The Fibonacci Spiral Model draws a geometric spiral whose growth is regulated by the Fibonacci series. Its growth parallels the rapid growth of the series itself. The golden spiral gets wider (or further from its origin) by a factor for every quarter turn it makes. To produce a uniform distribution in the plane of the spiral, points are separated by the golden angle. The Fibonacci Spiral Model was developed using the Easy Java Simulations (Ejs) modeling tool. It is distributed as a ready-to-run (compiled) Java archive. Double clicking the jar file will run the program if Java is installed. You can modify this simulation if you have EJS installed by right-clicking within the map and selecting "Open Ejs Model" from the pop-up menu item. Please note that this resource requires at least version 1.6 of Java. The source code zip archive contains an XML representation of the Fibonacci Spiral Model. Unzip this archive in your EJS workspace to compile and run this model using EJS. This material is released under a GNU General Public License Version 3 license. W. Christian, Computer Program FIBONACCI SPIRAL MODEL, Version 1.0 (2012), WWW Document, (https://www.compadre.org/Repository/document/ServeFile.cfm?ID=12520&DocID=3148). 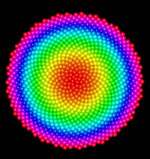 W. Christian, Computer Program FIBONACCI SPIRAL MODEL, Version 1.0 (2012), <https://www.compadre.org/Repository/document/ServeFile.cfm?ID=12520&DocID=3148>. Christian, Wolfgang. "Fibonacci Spiral Model." Version 1.0. https://www.compadre.org/Repository/document/ServeFile.cfm?ID=12520&DocID=3148 (accessed 21 April 2019). Christian, Wolfgang. Fibonacci Spiral Model. Vers. 1.0. Computer software. 2012. Java 1.6. 21 Apr. 2019 <https://www.compadre.org/Repository/document/ServeFile.cfm?ID=12520&DocID=3148>. The Easy Java Simulations Modeling and Authoring Tool is needed to explore the computational model used in the Fibonacci Spiral Model.